A countersink is a tapered hole drilled with a wide outer portion. A common usage of the countersunk hole is to allow the head of a flat head bolt or screw, when placed in the hole, to sit flush with or below the surface of the surrounding material. A Countersunk Hole is made with use of a drill bit and treating a laser cut hole with the bit to taper out the countersink. 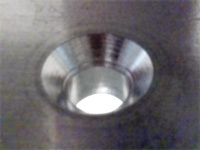 Unless otherwise specified, countersunk holes are of a diameter 0.10-.015" larger than the basic size of the laser hole at . 80 (or 82) degree and 100 degree countersinks are most common for flat head screws. Proper hole size and countersink size for screws.